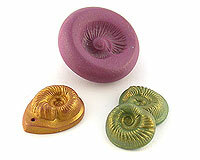 Scrappy Moulds are exclusive to EJR Beads - moulds made by my own fair hands from scrap polymer clay. You can use these moulds to texture all types of clay - use them with unbaked polymer clay or air-drying clays like Makin's, Precious Metal clays or ceramic clay bodies. In all cases you want to remove the moulded clay as soon as possible. For polymer clays you can use a misting of water or some cornflour as a release agent. With air-drying clays I tend to just let the clay sit in the mould for a little bit and then whack it hard on the back to remove!